Until the first high-altitude photographs were taken, the principal methods of cartography have been the same throughout the entire history. If you are able to measure distances and angles, you have everything you need to map the world – this is the main focus of geodesy. 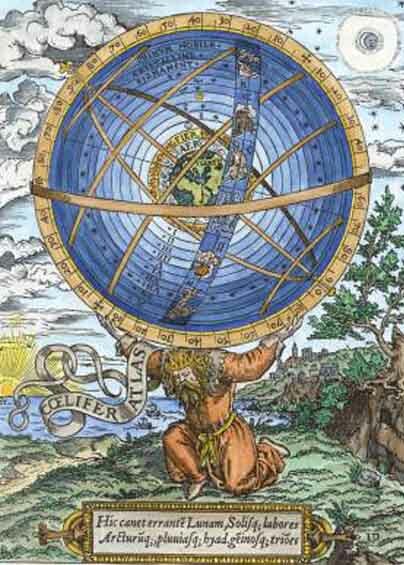 Cartography then is just a trivial visual representation of geodetic data. If you watch how the sun moves across the sky throughout the year, you will be able to see that the length of the sun’s path across the sky and the exact place where it rises and sets shifts as the months go by. On the northern hemisphere, sun rises and sets at its northernmost point on the summer solstice (midsummer), and at its southernmost on the winter solstice. The equal point between these two extremes occurs at equinoxes, and if you connect the two opposite points on the horizon where the sun sets during the equinoxes, you can accurately determine the east-west axis. The same thing applies to the celestial sphere. After observing it for a while it is very easy to come to a logical conclusion that it forms a sort of “sphere” that revolves around the earth, with its rotational axis fixed at Polaris, and the sun and the planets very slowly moving on trajectories close to the equator. This has been of course widely known throughout the history. One of the main problems of very early cartography was that using the Sun or the Moon to measure the fixed four cardinal directions (north south, west east) was unreliable, as their positions in the sky significantly changed throughout the year and varied as the latitude changed. The margin of error could be massive if one did not know the precise time of the year and did not have a precise enough way to measure angles, he could stray up to 25 km to the side from the intended target 100 km away. However, the point at the horizon that is intersected by the celestial equator (stars that move the fastest during the night) is the same at any latitude, and if we know some of the constellations and stars that are very close to the equator, we can measure east and west with utmost accuracy. The most important of such stars is Mintaka, the uppermost star of the Orion’s belt. If one flew around the earth at the equator, basing his direction only by the position of Mintaka, he would never stray more than 31 km away from the equator. To determine where the north is, just find the point of horizon closest to the Polaris. Of course, you also have to measure the distances between different landmarks and points on the coastline to make a maps. On the coasts of seas, lakes and rivers, you could simply aim to one direction and count your steps, trying not to deviate as much from the straight line, writing down the angular directions of every 100, 500, 1000 or more steps. Drawing an accurate coastline on mid-size maps of a tropical region and small maps of temperate regions is then trivial – draw a grid of small squares, mark your starting point, draw a continuous segmented line throughout the grid, with one segment being the fixed amount of steps you walked in one fixed direction. Though most people did not really need maps when traveling on foot or horseback, as they usually followed already well-known paths and roads, cartography was extremely useful in the field of sea travel, as there were often no orientation points for thousands of miles and one could get lost very easily if he did not know how to determine his position with enough accuracy. Same process as when mapping land areas applies when measuring the length and relative angle of a distance traveled marine vessel, however, it is much more difficult to do it accurately, therefore distortions happen easily. Mapping land regions from within was exceptionally accurate even in ancient times mainly because one could determine walking distances with a very high degree of accuracy. It was also often possible to create a very detailed and accurate map of more than a hundred square miles of land in a very short time just by climbing on a mountain of a decent height and looking around. This map of Europe was drawn in 200 AD by Ptolemy, and similar accuracies were not achieved in medieval Europe until about 14th century. However, on the open sea, there are no discernible landforms one could peg his location to, and therefore determining the location of a ship on a latitude and longitude grid was always the only way to accurely estimate the distances between different continents and archipelagos. And this is difficult. So difficult, in fact, that it wasn’t until 1762 when the longitude relative to the Prime Meridian could finally be measured for the first time within a margin of error of 1 arc minute (±1 nautical mile), using a state-of-art chronometer H4, manufactured by John Harrison, who received an 18th century equivalent of a Nobel Prize because of it. However, these clocks remained quite expensive for a long time, and decreased below the sum of the annual wages of a skilled worker few years after Napoleon was exiled to St.Helena. Until then, majority of sailors used the much less accurate method based on measuring the angles of the moon and various stars, and comparing them to values in a large astronomical almanac, determining the time at the Prime Meridian and longitudinal distance relative to it. World maps only started to be very similar in their accuracy to those we hang on our walls in mid 19th century, however, it took well into the 20th century until the polar regions were finally thoroughly explored, with the last major blank spot being only filled in 1932, when the coastlines of the North Land Archipelago were finally charted. If we base what element is “heaviest” by its density, then Osmium is the densest stable element naturally found on Earth at 22.6 g/cm3, and Hassium is the densest artificially created element with a density of 40.7 g/cm3 (but it’s quite unstable). However, density is not mass – it just describes how closely packed together the mass is. Then the element with heaviest nucleus should be declared heaviest (there are also slight variations in atomic mass for the different isotopes, so let’s always take the figure for the stablest isotope). Uranium(92) would then be the heaviest element naturally found on Earth(atomic mass of 238), and Ununoctium(118) would be the heaviest element ever documented (after being artificially created), with an atomic mass of 294. Ununoctium is however only the heaviest of those elements we have directly detected. However, elements much heavier than Ununoctium definitely exist.Unnunoctium itself was only detected in 2002 for the first time, however it was already found in periodic tables from the early 1990s. All of the current theoretical models indicate a that stability tends to decrease as the atomic mass of nucleus increases(save for a few expections). However, Ununoctium’s half life of 0.001 seconds is not really a short one – it is trillions of times longer than the half-lives of many much lighter isotopes – you can see how short half-lives can get here. We have observed a number of isotopes that decay after roughly 10 -22 seconds, such as Hydrogen 4 (tritium with one more neutron). That is utterly ephemeral. Ununoctium 294’s 0.001 second half-life value is 3 magnitudes more distant from the half-life of hydrogen 4 as it is from the entire 13.7 billion years of the age of our universe. But how stable would elements beyond Ununoctium be? Current theories indicate that Ununoctium 294 is located at the shores of mass region known as “Sea of Instability”, where nuclei are expected to decay in order of microseconds. However, some scientists think that more massive nuclei might be located in a so-called “Island of Stability”, with unusually long half-lives (probably seconds). Ubinilium-304(element 120) and Unbihexium-310(element 126) are expected to be the most stable. There is not any defined maximum possible atomic mass of a nucleus, however according to IUPAC, for a nucleus to be considered a legitimate “element” ,it must have at least one isotope with a half-life of at least 0.7 x 10-14 seconds (time it takes for protons and neutrons in the nucleus to organize into nuclear shells). The heaviest element possible in the universe would therefore be the one with the highest atomic mass of all nuclei located above this half-life limit. Anything with a half-life lower than 0.7 x 10-14 seconds is not an element anymore. This is a very important issue in physics, and if solved, it could help us find a way to synthesize elements with incredible masses and use them. Before we start making any estimates about the range of lifespans for superheavy nuclei, It would be better to explain what exactly makes heavy nuclei unstable. a) Beta decay – most common type of decay in lighter elements. It is caused when a nucleus has unstable neutron-proton ratio (based on Pauli exclusion principle). It has two variations, β- changes a neutron into a proton, and β+ changes a proton into a neutron – emitting beta particles(leptons) in both case. The number of particles in the nucleus stays the same, only the quantity of protons protons changes. Very similar to beta decay is the process of electron capture, which absorbs one of the atom’s own inner electrons and changes one of its protons into a neutron. Alpha decay – Most common type of emissive decay, caused by repulsion of protons,ejects an alpha particle consisting of two neutrons and two protons from the nucleus, decreasing its atomic mass. Reason why heavier nuclei are more unstable lies in electrostatic repulsion of protons, which is stronger than the nuclear force at longer distances. Nuclear force, which binds protons and neutrons to other protons or neutrons in the nucleus is significant only in very short distances, becoming unnoticeable at ~2.5 fm(femtometers). However, many atomic nuclei are much larger than 2.5 fm in diameter; Uranium-238 nucleus is around 15 fm in size, and each proton or neutron only interacts with a few other which are the closest to it. To reduce the repulsive force between protons, it must have a lot more neutrons than protons (92 protons, 146 neutrons), increasing both the net value of nuclear binding force and the distances (and therefore reduces repulsive forces) between protons. When it comes to superheavy elements, most common type of decay is definitely either alpha decay or spontaneous fission. There are two major forces which govern how resistant are nuclei going to be in against those types of decay, those are the strong forceand electrostatic force, that give a total binding energy. As alpha decay and fission are the ways how the majority of superheavy nuclei will almost always decay, we will only focus on those. By looking at how half-lives decrease as elements become higher, we will be able to estimate the size range in which the heaviest element possible should be located. It is a very simplified method, but we could manage to end up with at least somewhat accurate figure. The heaviest nucleus possible that is still indefinitely stable is lead 207. Any heavier elements are located in the alpha decay zone. We can see a trend of heavier elements being progressively less stable than lighter ones on average, although there are some local irregularities. Very optimistic projection – derived marginal decay rate is significantly negative and elements will never have maximum half life of less than 0.7 x 10^-14 seconds, purely in theory, upper boundary of elements would only be at the point where the influence of gravity would overtake strong force, the object would be then considered a neutron star. These estimates are entirely based on statistics without any assumptions that major islands of stability can exist. However, I definitely hope that in the future we will finally discover how far the periodic table really goes.